Should Red Bull invoke team orders in Spain? 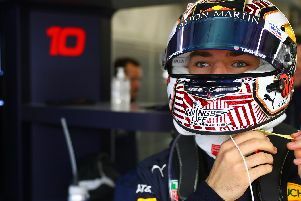 Struck at the Azerbaijan Grand Prix two weeks ago as Daniel Ricciardo ran into the back of Red Bull team-mate Max Verstappen - a cardinal sin in F1. So is it time for Christian Horner to clamp down on his drivers racing each other? Team orders are frowned upon in a sporting context. Preventing team-mates from racing as designed goes from sport to a Sunday afternoon cruise, but as has been seen down the years, it ends in tears when something goes wrong. Red Bull have had previous when it comes to team-mates colliding. Sebastian Vettel and Mark Webber crashed when battling for the lead in Turkey in 2010, and their relationship never fully recovered. McLaren team-mates Ayrton Senna and Alain Prost crashed while battling for the world championship in 1989, while the feud between Nigel Mansell and Nelson Piquet spilled into newspaper columns during their tenure together in 1986 and 1987 as the pair duelled for the title. More recently, Force India pairing Esteban Ocon and Sergio Perez clashed on so many occasions in 2017 that their team threatened to sideline the pair should they attempt to go wheel-to-wheel again, and Mercedes duo Lewis Hamilton and Nico Rosberg crashed in both Spain and Austria in 2016 while fighting for the lead. Heading to Barcelona this weekend for the Spanish Grand Prix, Christian Horner has a decision to make - should he let Verstappen and Ricciardo battle? Away from the track, the pair appear to have a great chemistry. On the track, their styles differ - Ricciardo more a thinker, Verstappen a spur-of-the-moment doer - but both are terrific overtakers, and to remove that from their armoury could dramatically impact on their popularity. Blame for their crash in Baku was laid at neither door by the stewards or indeed the team afterwards, and taking drastic action after one such incident may be a knee-jerk. Their battle at the Malaysian Grand Prix in 2016 was close but clean as Ricciardo went on to take the win at Sepang, while Verstappen's wayward Red Bull eliminated the Australian from the Hungarian Grand Prix after just three corners last year, so there is some previous, but none of the other top teams have been squeaky clean in that sense either. Whether team-orders will come into play in Spain, expect both Ricciardo and Verstappen, who won his first race for the team in Barcelona in 2016, to be on their best behaviour if they catch each other in their cross hairs.